I am taking a tech break. I will post quilt related info only. I will not be reading posts. I don’t agree with the data collection bit that’s going on. And there is just too much negative chatter. I’m off messenger too. If you want to connect My blog is a place. That will be updated once a week or more. Keeping you lifted in my prayers. Praying All the best for you and yours. Be awake! And please Vote! Can't stand the heat on FB, I will peek from time to time. For the most part my 'friends and family' on Facebook keep it real and positive but the reposting of something awful is, well awful. So I will miss a lot in the coming months. Remember whatever you post or repost stays in your account and as we have seen a lot can come back to bite you, so consider the ramifications. That job you want...gone, that affiliation you were counting on, gone. Posting under a fake name, no protection because your friends will dine you out. So family and dear ones just stop. By the way...People did not wake up when our president elect started running and decide to be what you see. They were always that way, in plain site. And most minorities and families who have chosen to be inclusive, or have adopted children, or, well just or...have had to spend years protecting and teaching each other how to be safe, and to be alert, and watch out for one another. It hurts when you thought you were safe and these thing happen. Other side of the % equation, now it's your turn to do the same. Teach your children and love ones to be safe. Be the blessing you want to see in the world, there are enough of us to make the change we want to see happen in our life time. I will be expressing my take on things in my writings and art works...and posting to valariepoitier.com, not FB. Keeping you lifted in my prayers. Remember what ever you post or repost stays in your account and as we have seen a lot can come back to bite you, so consider the ramifications. That job you want...gone, that affiliation you were counting on, gone. Posting under a fake name, no protection because your friends will dine you out. So family and dear ones just stop. Everyday I strive, I pray I work and rest to be what I want existing in the world. Be the blessing you want to see. Be the blessing you want to have. Be the blessing you want to hear. I make quilts that asks questions of the viewer. Be the blessing that solves the problem. Be the blessing that heals. Be the blessing that feeds a hungry soul. Be the blessing that cares for living things. Be the blessing you want in the world. Be the blessing that leads to joy. Be the blessings that needs not apologize. Be the blessing others emulate. Be the change that causes the blessing. Be the blessing. Just stand up and Be. Be the little you that 'is' larger, wiser, closer to the real truth, than the bigger you has become. Be That, that which your little self, knew to be true. Be the blessing and joy you were, are, before your first hurt, undaunted. Be that blessing to all, all of your life. You can be that blessing in my life. I can Be that blessing in your life. 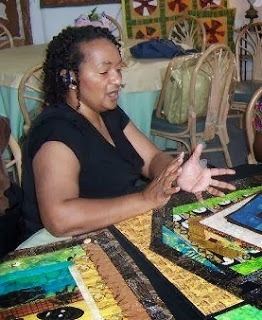 "Quilter and motivational speaker, Valarie Poitier gave a slide and trunk show. Her topic was "Promote Your Work Without Apologizing" and was fabulous. She was energetic, educational and very entertaining." tI met my match...Ms. Barbara and she is an amazing personality, wonderful quilter and a guild treasure and favorite. I thought she was perfect! Ms. Barbara my hat is off to you, what a gem! This concludes my winter Lectures. What a fabulous time I have had traveling and meeting new people, sharing, learning and growing in spirit and lessons learned. I am proud to represent the quilters in Massachusets where ever I go. Many of you and our sister states have helped me develop my current programs. If your guild is looking for a lecturer or workshop teacher contact me and let's see what we can arrange. Presenting: an Off the Wall, rib tickling, event. Quilts, dyed Fabrics, lecture, skits, stream of quilters consciousness, oh dear. Get ready to be entertained, educated, wowed, and terribly impressed when Ms. V lets loose, and not her quilting seams. A Lecture and a Trunkshow. 44 years in the making. No really there are at least two sewing projects scraps She will one day put in a quilt. How does one go from bed quilts to art hanging in museums across the country. And still keep her sense of humor, find her sharp scissors, create a layout for one hundred and fifty quilts, serve on the board of a museum, teach, and represent 100 Massachusetts Art Quilter's. Goss Hall of the Unitarian Universalist Church at 13 Maple Street, Mendon, MA (click here for directions).